As an innovative but controversial green energy financing mechanism picks up steam, hacked communications from a former White House official provide previously unreported insight into the confluence of public policy, private investment, and political money that helped fuel its rise. Property Assessed Clean Energy (PACE) is quickly gaining popularity as a means of outfitting commercial and residential properties with solar panels, energy efficiency improvements, and other environmentally conscious modifications. PACE allows homeowners to finance those modifications through loans from private lenders and to pay back those loans through their property tax bills. Local governments that levy those taxes pass on the assessments to the lenders. The financing mechanism has been around for a decade, but has picked up steam in the last few years. The industry and its supporters point to surging demand for home solar installations and similar retrofits as the driver of the industry’s sudden rise. While demand is certainly strong, PACE has also benefitted from politically powerful allies who have worked behind the scenes to remove significant regulatory barriers to its expansion, even as the regulators warn of potential costs to taxpayers and a lack of sufficient oversight. The result has been an explosion in the volume of PACE loans, a trend that has some market-watchers raising red flags about what the Wall Street Journal described this week as a potential credit bubble with troubling similarities to the housing market of a decade ago. "As the loans spread, so do problems that echo the subprime mortgage crisis," warned reporter Kirsten Grind. The industry rejects that suggestion, pointing to the relatively low number of defaults on PACE loans to date. However, credit rating firms say it hasn’t been around long enough to gather sufficient data on the soundness of PACE financing in general. Concerns about the structure of PACE loans have led to pushback from one government agency in particular: the Federal Housing Finance Agency. The unique structure of the loans, which generally prioritize repayment to PACE lenders before mortgage lenders in the event of default, "increases the risk of losses to taxpayers," FHFA said in late 2014. The agency's general counsel reiterated some of those concerns in testimony before the California state legislature last year. "PACE programs transfer risk. PACE programs fundamentally do not have comprehensive regulatory supervision. PACE programs have no required uniformity. PACE programs in many, but not all, instances are administered by third parties that do not follow the same consumer protection requirements applicable to residential mortgage lenders," FHFA warned in 2014. The policy hang-ups to the expansion of PACE prompted some in the industry to turn to public officials to help grease the bureaucratic wheels. Few government officials held more sway over federal energy and environmental policy than John Podesta in 2014. Emails stolen from Podesta’s account by hackers believed to be acting in concert with the Russian government provide a previously unreported look at how the industry enlisted Podesta in its effort to push back on FHFA restrictions. Cisco DeVries, the chief executive of PACE financier Renewable Funding, later renamed Renew Financial, reached out in April 2014 in the hopes of pressing Podesta on addressing some of the policy roadblocks to "PACE rebirth," as DeVries put it. "I think we are at a pivotal moment with the potential for real scale," he wrote. However, the FHFA was battling California state government over PACE, and the fight had the potential to dramatically alter the financial prospects for companies like DeVries’. Podesta forwarded the email to his assistant, but there is no indication that he responded to DeVries. DeVries followed up a couple weeks later. This time, he was sure to include the name of a deep-pocketed Democratic donor in the subject line. That donor was Nathaniel Simons, whose venture capital firm Prelude Ventures had just led a $20 million funding round for DeVries’ company. "Nat Simons recently invested in my company and we were having lunch recently when your name came up," DeVries told Podesta. "Perhaps the three of us can get on the phone sometime soon." An offshoot of Simons’ home office, Prelude bills itself as "a venture capital firm focused on climate innovation." Though driven by Simons’ ideological commitment to addressing climate change, it is first and foremost a profit-making enterprise, according to managing director Tim Woodward. "Everything we do must have a favorable impact on climate, but with an emphasis on financial return," Woodward said in a 2013 interview. "For our team, financial gain is not a secondary goal." As Prelude invests in green energy companies, Simons’ personal charitable vehicle, the Sea Change Foundation, pours tens of millions of dollars annually into environmental advocacy and nonprofit groups that seek policies conducive to green energy profitability. Sea Change doles out about $50 million in grants annually. Simons and his wife "may be the most powerful philanthropic couple working on climate change today," according to Inside Philanthropy. Through Sea Change and extensive personal political contributions, Simons has established himself as a sought-after donor for left-wing political causes and candidates. So when DeVries mentioned his name, Podesta, who would leave the following year to chair Hillary Clinton’s presidential campaign, was more responsive. He forwarded the email to his assistant, asking her to set up a meeting. DeVries wanted to discuss the FHFA and its antipathy towards PACE financing. Renewable Funding was trying to build out a massive PACE market in California, but FHFA was maintaining its skeptical attitude towards the emerging industry. At issue were the structures of PACE loans that put their lenders first in line to be repaid in the event of a mortgage default—ahead of mortgage lenders whose loans were guaranteed by Fannie Mae and Freddie Mac. FHFA considered the resulting risk to taxpayers unacceptable, and barred Fannie and Freddie from guaranteeing mortgages for PACE-financed homes. 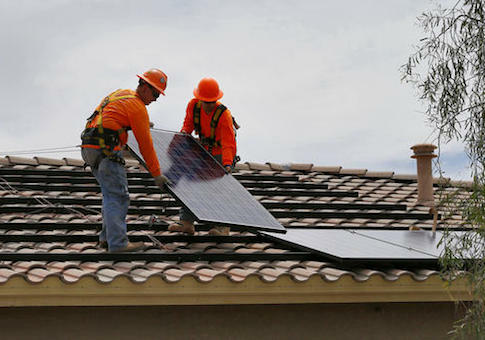 The lack of a federal mortgage guarantee would significantly discourage homeowners from seeking PACE financing, posing a serious problem for Renewable Funding and similar companies. Podesta and DeVries met in May 2015 to discuss that problem. "We want to eventually get FHFA comfortable with PACE," DeVries said afterwards. "If you felt there was a way to get to a real discussion, that would be great." California was already working to address the problem at the state level by creating its own "loss reserve fund" that would try to shore up confidence in homes with PACE projects by insuring mortgages on PACE-financed homes in the state in the absence of a guarantee from Fannie and Freddie. Even with that possible solution on the horizon, DeVries hoped Podesta would help address the problem at the federal level. "If possible, it would be good to get to a reasonable resolution with FHFA" before California rolled out the loss reserve program, DeVries wrote. "However, we can certainly live with longer term ambiguity if needed to avoid a bad resolution," he added. As DeVries invoked Simons’ name behind the scenes in the hopes of White House resolution, green groups funded by Simons’ Sea Change Foundation were publicly hammering policymakers in an attempt to roll back FHFA’s opposition to PACE. "What's the purpose of our government?" asked Sierra Club president Michael Brune on his group’s website. "No matter whom you ask, I doubt that stifling innovative solutions would be part of their answer. Yet that's exactly what [FHFA] seems determined to do" by inhibiting PACE financing. "Send your comment today and urge the FHFA to stop opposing energy-efficiency and renewable energy upgrades," Brune wrote. The Natural Resource Defense Council urged "individual, NGO, and corporate stakeholders nationwide … to respond to FHFA’s proposed rulemaking opposing PACE. … It is critical that FHFA hear from as many stakeholders as possible who support the PACE financing mechanism." As Simons-funded groups pressed the administration, Simons’ himself was getting extensive White House access courtesy of Podesta, who arranged a meeting directly with President Obama and his top political operative David Simas to discuss a White House-hosted "gathering of climate and clean energy leaders." Podesta also got Simons and Sea Change vice president Steve Colwell in the door for a meeting with Hillary Clinton and her top aide Huma Abedin in late 2014. That meeting took place in Las Vegas during the annual summit of a Nevada green energy group called the Clean Energy Project, whose board previously included Podesta. It currently includes Brent Heberlee, a lobbyist who represented Simons personally as he pushed for federal legislation in 2009 creating a national cap and trade system. Heberlee also attended the meeting with Clinton and Simons. It is not clear whether PACE came up at that meeting, though Clinton’s failed presidential campaign later backed the financing mechanism as part of its energy policy platform. It is also not clear what specific steps Podesta took to get FHFA on board in response to DeVries’ requests. However, by the time the next Clean Energy Conference took place, the agency had agreed to soften its position on PACE. At that conference, President Obama announced that FHFA would allow Fannie and Freddie to guarantee mortgages on properties with PACE-financed projects provided that, among other criteria, the PACE loans were not the first in line for repayment. It wasn’t a slam-dunk for PACE financiers, but the industry cheered the White House’s efforts to establish some measure of bureaucratic predictability. "Until now, regulatory uncertainty has limited the expansion of PACE financing for single-family homes," DeVries said in a statement. "Today, PACE became a national clean energy policy priority." Since 2015, total PACE financing nationwide has more than doubled. Securitization of PACE financing has more than tripled, as investors, unperturbed by warnings from FHFA and industry critics, gobble up bonds backed by PACE loans. The industry rejects any suggestion of a credit bubble, pointing to low default rates to-date. DeVries told the Journal that he is "really proud of what we’ve accomplished. … We set out to help people save money and save energy, and it’s under way." He did not respond to questions about the role of policy advocacy in that mission. Simons and Podesta also did not respond to requests for comment. This entry was posted in Issues and tagged Green Energy, Solar Energy. Bookmark the permalink.